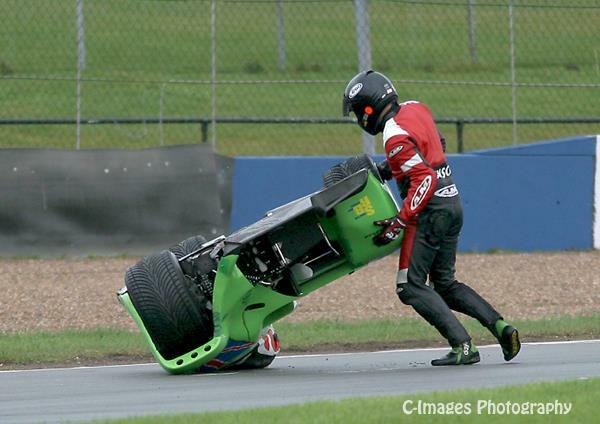 The final round of the Thundersport GB races came to Donington Park this weekend and with 9 championships within the series yet to be settled there was an air of anticipation and excitement around the circuit. 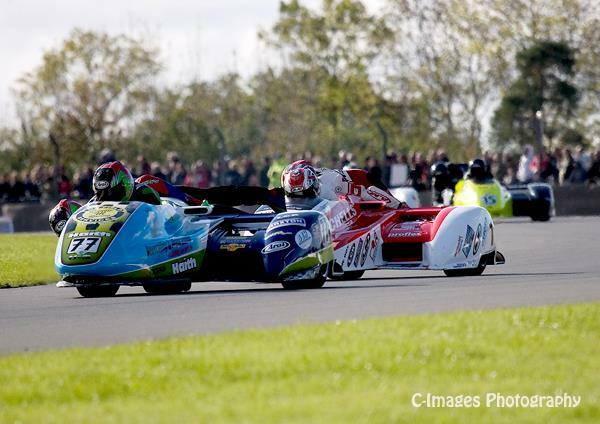 The Eastern Airways sidecar championship was a key high note for the weekend with the championship leaders Tim Reeves and Greg Cluze (No 77) trying to secure the title from their season long rivals the Birchall Brothers (No 1). Saturday’s weather matched the series title with lots of rain and the odd peak at the sun making the racing conditions that much more of a tricky choice for set-ups. Qualifying was in mixed conditions with a damp track and some short breaks in the cloud cover to allow some sunshine to break through. The tricky conditions had the field sliding through the first corner at Redgate until the unfortunate Bygrave and Charlwood went a little too quick resulting in them tipping the outfit over ejecting passenger Charlwood and trapping driver Bygrave inside with those that were following them having to take rapid avoiding action. 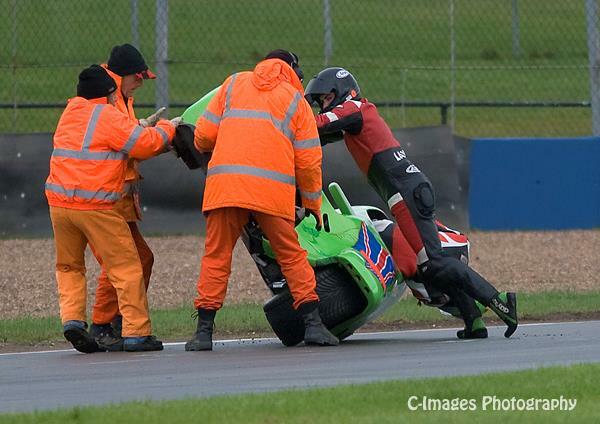 As ever the great British marshals were soon on hand to assist to free the trapped Bygrave. That brought out the red flag for a while but soon the field were back on circuit and trying just as hard to get a good grid position. Unfortunately the number 74 pairing soon had the crowd gasping again as they once again got it sideways through Redgate but this time managed to remain the right way up even if they were now facing the wrong direction. Saturday’s race was won by Tim Reeves and Greg Cluze with the Birchalls way down the field in 8th as they had gambled on using intermediate tyres in the mixed conditions. Second in the championship Schofield and Thomas finished 5th. Sunday’s first race was much more closely fought between the top three championship pairs. 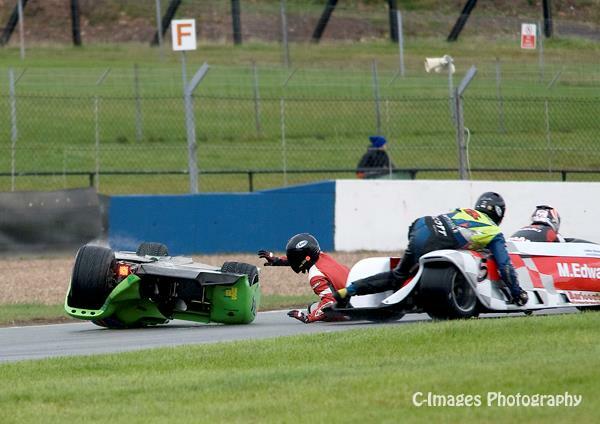 Reeves and Cluze had a incident on lap three which dropped them down into 5th over 12 seconds behind the Birchalls. But by lap 8 they were back in second position 3 seconds ahead of Schofield/Thomas. The second race on Sunday saw the usual top three teams out in front but this time it was Schofield/Thomas that led after the end of lap 1 with Reeves/Cluze in second and the Birchalls 3rd. By lap 3 the Birchalls had passed Schofield and Thomas to be right on the rear wheel of Reeves/Cluze and that was the way it stayed until lap 7. With Reeves and Cluze in the lead along the Dunlop straight and heading for the new complex at Goddards the Birchalls were pushing hard, and so hard that they carried just too much speed into the braking zone and ended up losing their outfit under heavy braking, sending them into a spin and down the order to finish in 4th losing nearly 18 seconds in the incident. Lubek, Germany custom bike builders House of Thunder have taken the term ‘boys toys’ to a new level. Can you hear the Thunder? Bikers flock to the Highlands for annual rally.